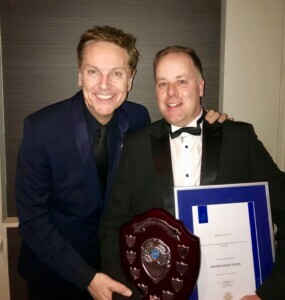 Last night at an event in Brighton, Brian Connelly, on behalf of one of the UK’s largest house builders, presented us with the ‘Small Volume Sub-Contractor of The Year’ award. Here Simon, our Contracts Manager, proudly accepts the award on behalf of the Company. We are so pleased for our Installation and Office teams as their continued hard work maintains the quality of service needed to win these types of accolades. Well done to all!